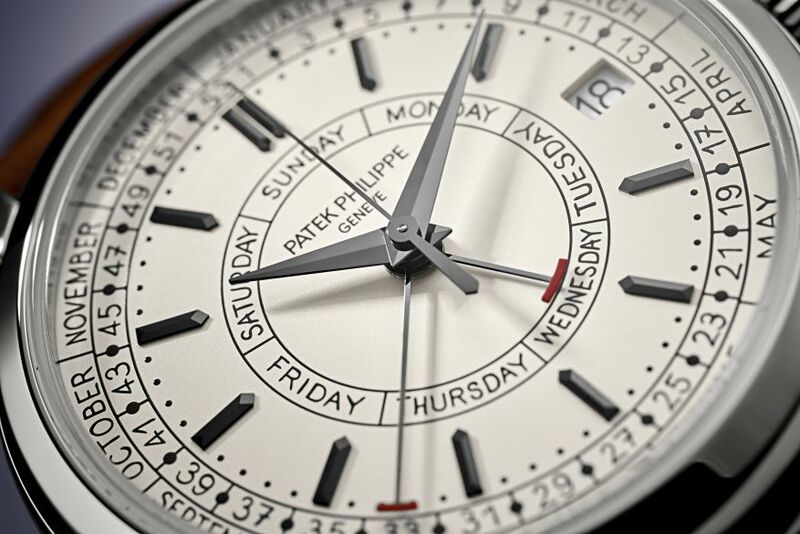 Patek Philippe introduces a new function for calendar watches: The weekly calendar is a semi-integrated mechanism that in addition to the day of the week and the date also displays the week number. Further, the Ref. 5212A-001 Calatrava Weekly Calendar is endowed with a totally new self-winding base caliber. 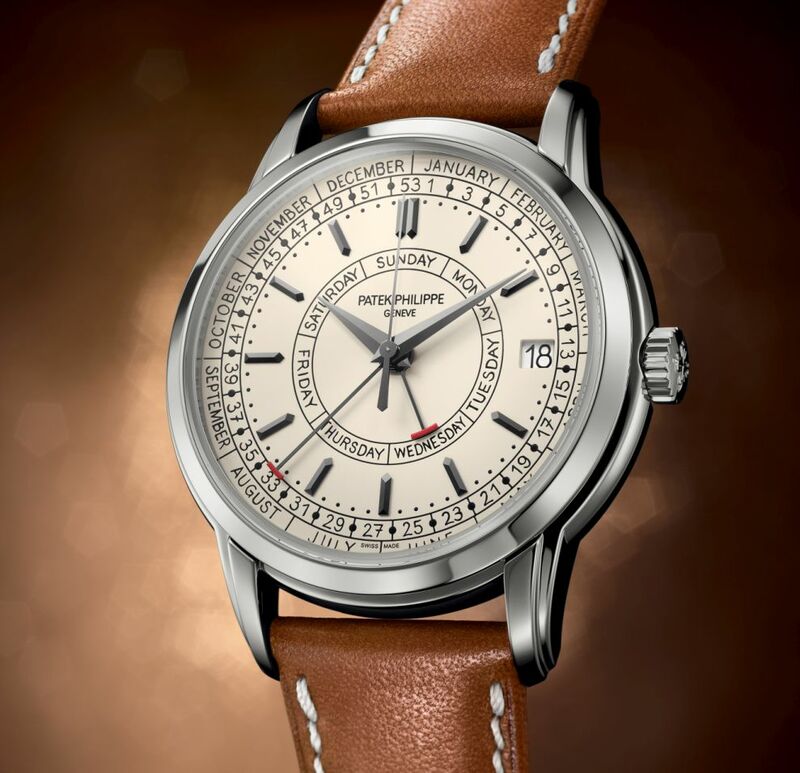 Patek Philippe has developed a broad spectrum of calendar functions, from the simple aperture date to the extremely complex secular perpetual calendar that is preprogrammed into the 28th century. For quite some time, the perpetual calendar has established itself as a genuine specialty of the manufacture. The patented Annual Calendar, launched in 1996, triggered a small revolution as a full calendar that only needs to be corrected once a year on March 1. In 2013, the Ref. 5200 Gondolo "8 Days, Day & Date Indication" was welcomed as a fascinating innovation with its instantaneous day-of-week and date display. 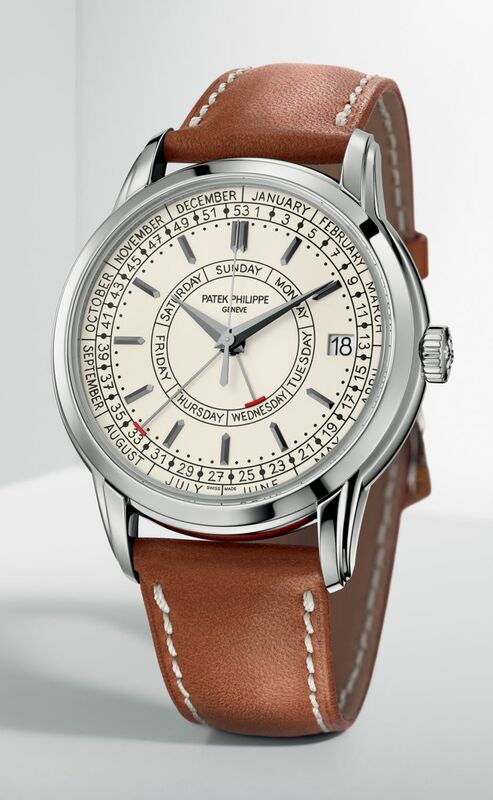 Now, Patek Philippe is taking a step forward by expanding its collection of "useful complications" with the addition of a weekly calendar that displays the current week number. It is a decidedly practical function in a globalized world, even in the smartphone era. The new Ref. 5212A-001 Calatrava Weekly Calendar expresses its uniqueness with a silvery opaline dial and the unusual layout with five hands from the center quite a rare configuration. The hours and minutes are indicated with elegant Dauphine hands in blackened white gold. They feature two lapped facets, a perfect match for the applied baton indexes in blackened white gold with four lapped facets each. A slender counterbalanced hand tracks the seconds. The day of the week is displayed by a hammer-shaped hand with a red hammer head on a circular scale in the middle of the dial. A second hand of the same design delivers week number and month readings on two concentric scales at the periphery of the dial. These calendar indications are complemented by an aperture date at 3 o'clock. Another special feature: The typography created explicitly for this watch is based on the handwriting of one of the manufacture's designers; its letters and numbers are absolutely unique. Carefully printed in black, they add very personal and poetic notes to the dial of the Ref. 5212, recalling an epoch in the not too distant past when notes were still written by hand in paper diaries. With a diameter of 40 mm and a thickness of 11.18 mm, the stainless steel Calatrava case a rarity at Patek Philippe also stands out on account of the finesse of the bezel that extends over the two-tiered, gently curved strap lugs. The case is cold-formed in the manufacture's ateliers with high-tonnage presses and then meticulously hand-polished by experienced artisans a highly complex undertaking given the many sharp edges and angles. Its aesthetic appeal is inspired by the Ref. 2512, a one-of-a-kind piece made in 1955 and held in safekeeping by the Patek Philippe Museum. This kinship is emphasized by the reference number of the new Calatrava Weekly Calendar that consists of the same numerals in a different order. The vintage aspect is amplified by a box-type sapphire-crystal glass with a slightly cambered profile. The stainless steel snap back has a sapphire-crystal inset that allows the movement to be observed at work. 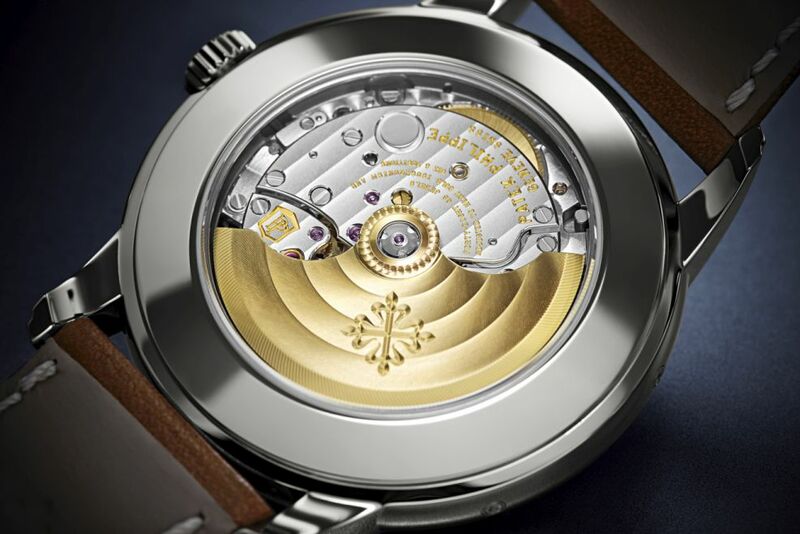 To display the day of the week and the number of the current week, Patek Philippe developed a totally new semi-integrated mechanism with a height of 1.52 mm, containing 92 additional parts. Thanks to a special plate developed and produced for this specific mechanism, the movement remains very svelte. A 7-point star on the hour wheel in the center of the movement controls the day-of-week display. Via a lever, a second 7-point star with an extended Sunday tip drives the 53-tooth week wheel. The calendar displays advance semi-instantaneously in discrete steps to avoid energy consumption peaks. Corrections of the day-of-week and week-number displays are performed with two push pieces recessed in the case flank at 8 and 10 o'clock. The date can be corrected with the crown pulled halfway out. Thanks to a fail-safe concept, the user can perform such corrections at any time of day or night without risking damage to the movement. The manufacture places great emphasis on convenience and user-friendliness. Pursuant to the international ISO 8601 standard, Patek Philippe chose Monday as the first day of the week rather than Sunday, which is commonplace in some countries. The first week of the year is the week that includes the 4th of January. The 53-graduation scale considers years with an extra week. This is the case every 5 to 6 years. The next occurrence falls in 2020. The weekly calendar mechanism is not the only special feature of the Ref. 5212. 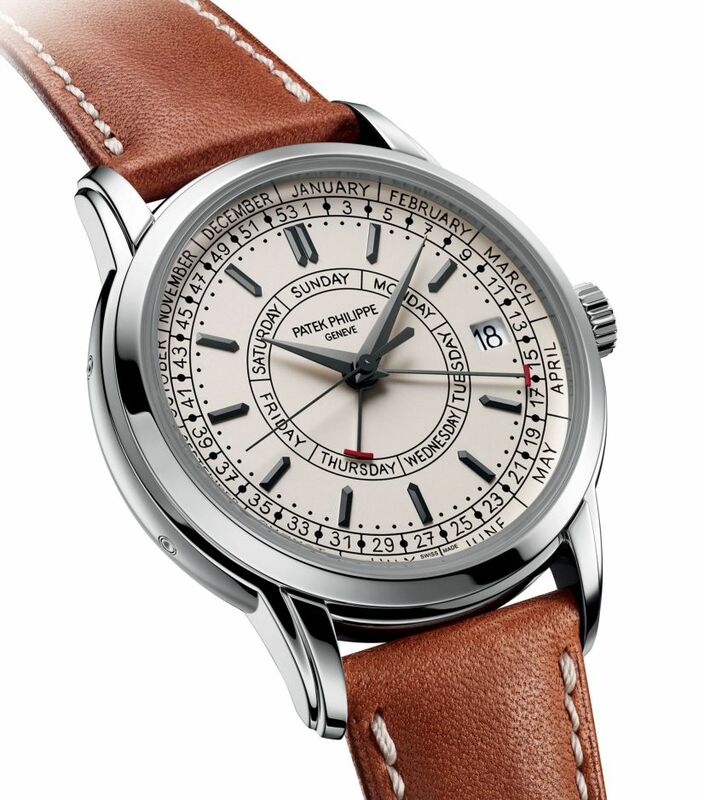 Patek Philippe also endowed this watch model with a totally new movement based on the self-winding caliber 324. It is the outcome of several years of development work. The caliber designation 26-330 reflects its diameter of 26.6 mm and height of 3.3 mm. The new movement sports several innovations and optimizations that improve its performance and dependability. The first innovation concerns the center second. To prevent the seconds hand from vibrating and to eliminate friction, the manufacture's engineers decided against the habitual center second pinion with friction spring. They replaced it with an innovative system based on an anti-backlash third wheel. This patented component is made of a nickel-phosphorous alloy with the LIGA process (lithography, electroplating, molding) and then completed with a gold-copper-iridium coating. It features an avant-garde geometry with long split slotted teeth, each with a tiny integrated 22-micron leaf spring that engages with the second pinion teeth to suppress vibrations of the seconds hand without any prior adjustment work. Friction is further reduced by suspending the pivots of the seconds-hand arbor between bearing jewels. The stop seconds (balance stop) mechanism provides further optimization: it becomes effective when the crown is pulled into the handsetting position. Thanks to this device, the user can set the time with one-second accuracy. When the crown is pushed home, the mechanism kick-starts the balance, so to speak, to set it in motion again. Optimized automatic winding The self-winding mechanism was also completely reworked and refined. The most prominent change involves the shape of the winding rotor that now has two rounded recesses on both sides of its axis of rotation. This is an unmistakable characteristic feature of the new caliber 26-330. Further substantial modifications improved the efficiency and longevity of the unidirectional winding mechanism. The first optimization of the automatic winder with the centrifugal mass replaces the traditional uncoupling yoke with a pinned spring by introducing a new patented clutch wheel that is manufactured with a highly complex process. It drives the mainspring barrel in one direction and uncouples it in the other direction. The second optimization consists of a reduction wheel that is uncoupled from the automatic winder when the watch is manually wound. When parts that generate friction and need to be tweaked are replaced with high-tech components, this improves the performance and dependability of the movement. With its 304 parts (including those for the weekly calendar mechanism), the all-new caliber 26-330 S C J SE is a perfect manifestation of Patek Philippe's tradition of innovation. The sapphire-crystal case back of the new Ref. 5212A-001 Calatrava Weekly Calendar reveals the refined architecture and painstaking finissage of the movement as prescribed by the Patek Philippe Seal. Interesting, but that's one busy dial. Regards. Ned. I like it but enough to buy at this point! Previous Topic: Finally found a 5167A!